Have a plumbing problem? We have a Solution. 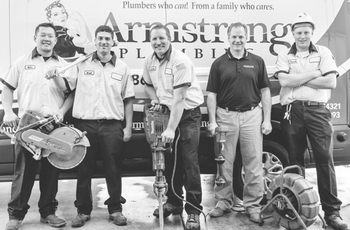 Find out what makes Armstrong Plumbing different from other companies offering plumbing services. The depth of our knowledge, specialty equipment and ability to problem solve in the residential or commercial/new construction is endless. When you have a plumbing emergency, we know finding the right company to perform your repairs or installations in a timely manner is essential. No one has a better understanding of Sacramento’s plumbing infrastructure than our team! Plus, we specialize in older homes that require unique expertise. With over 140 years of collective experience, if we can’t do it, no one can! Our success over the 50 years is a reflection of the team we employ. Training, tools, mentoring and life balance are an essential part of the framework we provide to ensure that we are the best our industry has to offer. We are not just a company, we are family! We’re one of the few remaining plumbing companies whose technicians don’t work on commission. That means you’ll never experience high-pressure sales—just friendly, expert service at a competitive price. As one of the area’s only woman-owned plumbing companies, we’re dedicated to the craftsmanship and care required to ensure that you are always satisfied. Whether your kitchen sink is backing up, or you are experiencing slow drains. Let us handle that leaky toilet or install new plumbing fixtures in your house. If you have old style plumbing features like cast iron or orangeburg, our team is prepared to help! 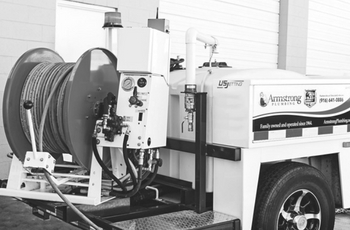 Whether you’re starting construction on your building or need to repair a plumbing issue at your facilities, our commercially trained technicians are driven to solve your problem quickly and efficiently. We have the equipment and resources to consult and collaborate on the most complicated projects. Serving Antelope, Cameron Park, Carmichael, Citrus Heights, Clarksburg, Davis, Dixon, El Dorado Hills, El Macero, Elk Grove, Elverta, Fair Oaks, Folsom, Gold River, Granite Bay, Lincoln, Loomis, Mather, McClellan, North Highlands, Orangevale, Rancho Cordova, Rancho Murieta, Rio Linda, Rocklin, Roseville, Sacramento, Sloughhouse, West Sacramento, Wilton, and Woodland. 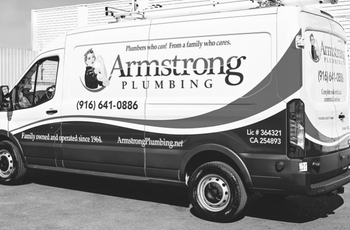 For over 50 years, Armstrong Plumbing has been Sacramento’s choice for full-service residential and commercial plumbing. Our master craftsmen can solve the most complex challenges, and they treat every customer with care. With over 140 years of combined experience, our service technicians can do it all. And we do it with personal attention, honesty, and integrity. Just see what our customers have to say! Request an estimate or call 916-978-1084 to schedule service!